It doesn't really matter if 8 is the first or the last digit, it's forbidden to use it. But again, I can't write a single line of code. I fixed this bug by checking the current value. If it is only 8 or 9 (no other numbers or a dot) then nothing happens in oct mode from now. But if you´re in Na'vi (oct) mode and type 68, all digits will be shown. Arrgh... This way it´s impossible to type 80, 800, 85812... because the 1st digit ( allways will be ignored. 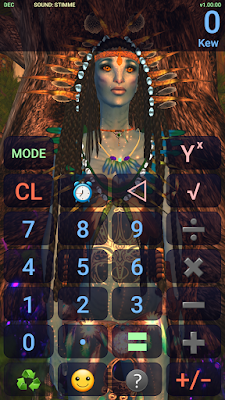 The octal mode accepts 8 and 9 in the calculations and in the result. You don't have to mask the keys, you might just ask to give no output when pressing them. Let's say you type a number in the decimal mode and switch to octal mode. The conversion is correct, but the Na'vi word changes (which is incorrect). Yep. Some days ago I figured it out. I´ll change it in one of the next versions. Yeah, and it has a German accent. I would correct the audio for the exponent because it says /vi.ʁe: nitʰ.ul/. There is no t.
ä is not /ɛ/ or /e:/, but rather /æ/. The closest sound is /a/; however, I think your German TTS will say /a:/. Or you can ask if you're allowed to use the audio samples from dict-navi. Ngrr is the equivalent of Microsoft Sam's "soi". Kämunge is pronounced x/ke:muŋə/, which makes comprehension a bit difficult. since a few weeks, I´m learning how to make Android Apps. My first big Thing is a calculator APP for Android mobiles. It also can translate the time and date. If you want to have a look, just visit MY BLOG. You can download and install the App (23.7 MB) from this site. Unfortunately, for several reasons, I´m unable to distribute the APP through the Google Play Store. • You need a mobiile device or an emulator which has Android 4.1 (Jelly Bean) installed. • The App DOES NOT need (!) any access to the microphone, the camera, your accounts, GPS, Emails, etc. • It does NOT save/send any of your personal data. • You only havt to activate the installation from unknown sources. • The speech I have recorded from a TTS voice and I tried to build the best and correct Na'vi like speaking as possible. • You can change the in-App language to german, english and Na'vi, but it is possible to add other languages. • This App will never be released for iOs, becuase my IDE only compiles Apps for Android mobiles. If you have any suggestions, error reports, ideas, etc. just post it here or visit my discord server. Enjoy it and happy Easter. ich habe mich in der letzten Zeit mal ein wenig in die APP Programmierung unter Android eingearbeitet. Mein erstes kleines [ik]Meisterwerk[/i] ist eine Taschenrechner APP, die Na'vi beherrscht. Außerdem kann es die Zeit und das Datum ebenfalls übersetzen. Wer es sich mal anschauen mag, der findet HIER meinen Blog. Von dort könnt Ihr Euch die APP (23.7 MB) runterladen und installieren. Leider ist es mir aus mehreren Gründen nicht möglich, die APP über den Play Store zu verteilen. • Ihr braucht ein Gerät, bzw. Emulator, auf dem mindestens Android 4.1 (Jelly Bean) läuft. • Die APP benötigt KEINERLEI (!) Zugriff auf Mikrofon, GPS, Kamera, Konten, Emails, etc. • Es werden KEINERLEI Daten von Euren Mobilgeräten gespeichert, versendet oder was auch immer. • Ihr müsst nur zur Installation erlauben, APPs von unbekannten Quellen zu installieren. • Die Sprachaufnahmen habe ich per TTS aufgezeichnet und so nah wie möglich an ein korrektes Navi gebracht. • Bisher kann man die APP in deutsch, englisch und Na'vi einstellen, ich könnte jedoch andere Sprachen einbauen. • Es wird KEINE iOs APP geben, da mein IDE leider nur Android APPs compiliert. Anregungen, Fehlermeldungen, Fragen, Vorschläge, etc. könnt Ihr gerne hier posten oder Ihr besucht meinen Discord Server.. I was never on ToS. Kaltxì, oel ngati kamiei, ma Toliman. Not good news, the file corrupted - I tried to fix it, but I need to start over. Eltur tìtxen si nìtxan and beautiful!